Flying on a new airline was definitely in my agenda. When I checked the air fare for China Airlines, so happened that the airline was having offers on most routes. I did a check on my desired route: TPE-HKG and it was S$200 which to be honest, was still considered expensive for a short route but I was going for it anyway to finally try out the airline and its Boeing 747-400. The airline has already made plans to retire this aircraft type and that will take place once its replacement, the 6 Boeing 777-300ERs enter service. 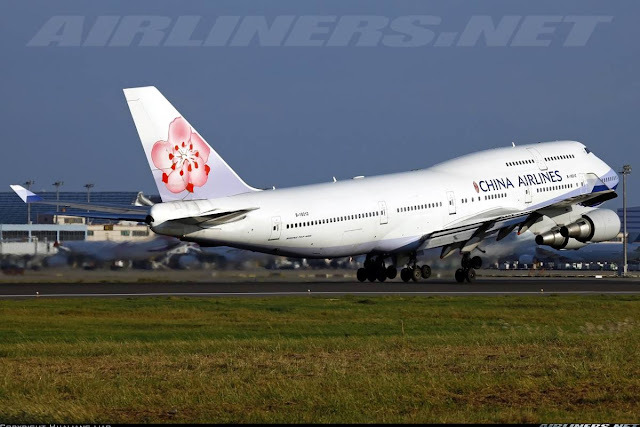 Its pretty sad that the Boeing 747-400 is being phrased out at a fast rate due to its high operating cost and the availability of newer aircraft which offer economical operating cost. Once the decision was made, it was time to book the air ticket through the airline's mediocre website. I won't say its the worst but it is pretty bad considering that its in the 2010s. The website make you feels like in the early days of internet. Even though it was pretty basic and lack of lots of features compared to the better airlines out there, at least it was working properly. As for the mobile version, it was no better than the word 'pathetic'. That's how I disappointed I was with the airline's websites (both versions). What I dislike about my flight was having to wake up early which for this case, around 5 in the morning. I took the airport bus directly to the airport from Sheraton New Taipei Hotel and the ride took about an hour to get there. 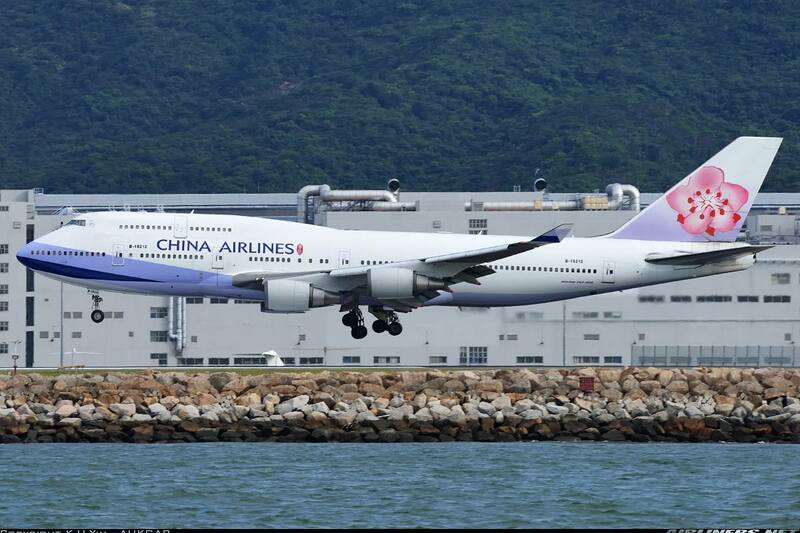 Once I reached terminal 1, I made my way to the check-in counter of China Airlines. It was so crowded at that time, fortunately for me, I had done my online check-in so I could skip the long queue and get my boarding pass quickly. The check-in counter lady initially put me on the very first flight, CI601 to Hong Kong and I thought it was operated by Boeing 747-400. It was a good thing that I asked her what aircraft was operating that flight as it was then operated by an Airbus A330-300 ("CI-ed" which means last minute aircraft change - a term commonly used when the schedule aircraft we want gets change to other types). Immediately, I told her to switch me back to my original flight as I wanted to fly the Boeing 747-400. Fortunately, she was very kind enough to make a few phone calls and checks and she successfully did the change back for me without any frown at all. Thank you! A good start for me, that's for sure! I noticed that the trees outsides were swaying quite violently and I went outside for a while, true enough it was very windy but flights were still taking off on time. I expected a rough take-off from how the weather was like. Apparently a typhoon was not too far from where I was, quite lucky to be leaving at this time. If I had left later, my other flights could have been in jeopardy. Once that was done, got my boarding pass and off I went! I was 89th in the queue. After passing through the immigration, I made my way to my gate. While heading there, I decided on breakfast somewhere along the way. Found a cafeteria and that's where I settled for some nice Century egg porridge that came with some local side dishes. Absolutely delicious, I paid about NT$120 (S$5) for the meal including a drink. The 'Queen of the skies' is waiting for me! Looking at the crowd, it looks like a full flight which turned out to be. My ride to Hong Kong! Credit to the following photographers. Boarding was slightly delayed and apologises were made many times. However, it didn't take too long and we started boarding about 10 minutes before the actual departure time. Unfortunately, I was one of the last few to board as the queue started very early. When I got to my seat, my seat mates were there and later on during the flight, I chose not to explore the cabin. 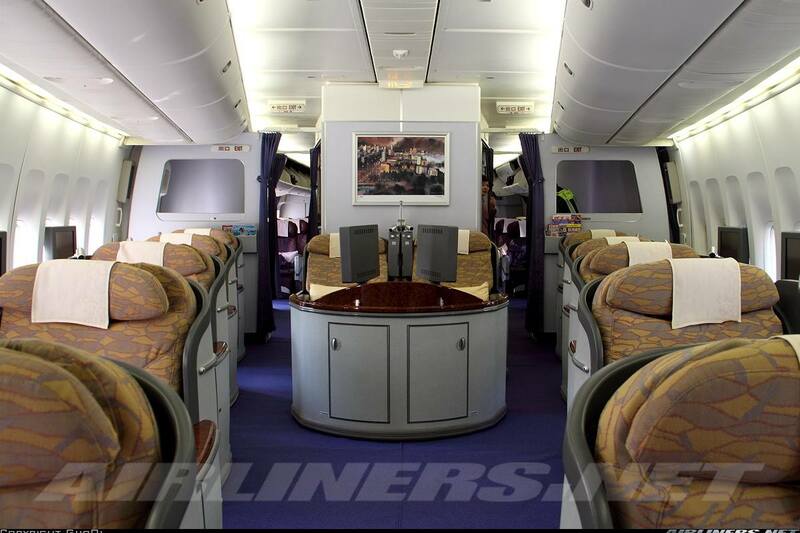 Here are some photos of the Y class cabin including photos from other photographers. 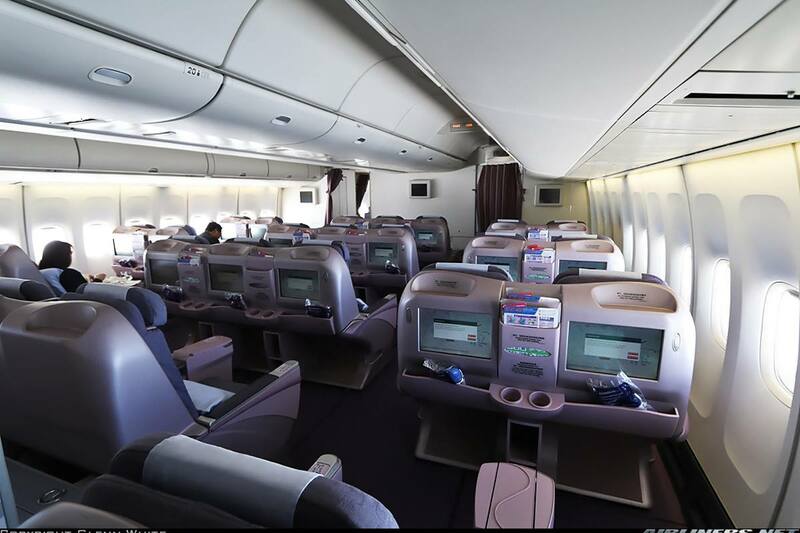 First generation IFE system, reminds me of EVA Air's 747 Combi IFE system. The seat pitch was a bit tight for my liking, but it was bearable. 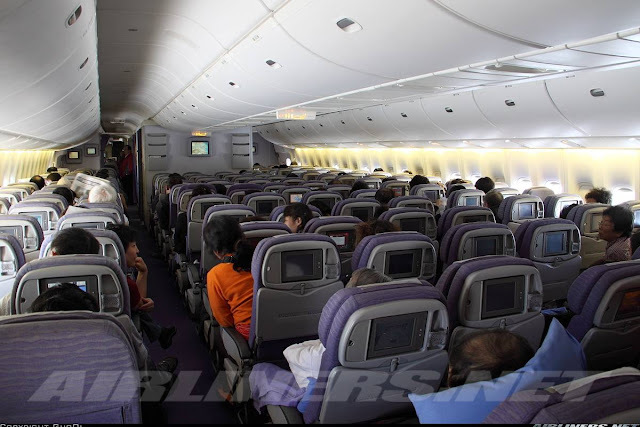 The cabin view of the Y class after flight. Somehow I find the colour looks very dull. All 3 classes look dated but the airline will be replacing this workhorse with the Boeing 777-300ER and will be introducing new in-flight products on all the 3 classes, so if you are flying on the 747-400, do bear with it! For the aviation enthusiasts, its thrilling but for others they may find it uncomfortable and bored. Safety card to tell you the safety features of the aircraft. Quite a number of magazines inside the seat pocket! Both EVA Air and China Airlines do rely heavily on in-flight sales for extra income and it seems quite popular with the frequent flyers especially the locals. The headset which I did not use at all, pointless for such a short flight. Stepping on board was the thrilling part but to see disinterested faces from the cabin crew was disappointing. Short flight and full load = hard work. This I can understand, but still you have to try your best make the passengers welcome! In this aspect, this set of crew failed. I made my way to the seat, being ignored by the crew who were standing along the aisle for what? Fashion show? Anyway, got to my seat and watch the rest of the activities taking place on flight. During the flight later on, the crew came about serving food and drinks quickly. They were neither rude or polite, just rushing to get their jobs done. I heard this airline has better in-flight service than EVA Air, but for my flight, its not the case. Here is the photo of my in-flight meal. Opening the tin foil and this was what I get! There was no selection of meal, only beef was available. So for those who don't eat beef, I guess you have to make a request to the airline before the flight. The beef rice was decent, nothing to shout about. I always have a thing or two for Taiwanese's pineapple cake and this one doesn't disappoint. The take-off was one of the most turbulent ones I had. Even when the plane started rolling, it was already shaking quite a bit from side to side.The lift-off may be effortless, it was very bumpy with lots of "drops" that made my stomach goes "What is going on?" Once we left Taiwan, the flying condition improved and eventually no more turbulence for the rest of the flight. From take-off to landing, please enjoy! Such a beautiful weather and one would be expecting fine flying condition but it wasn't the case! It was like a roller-coaster ride at this point! It was still bumpy at this point but not as bad as the take-off. The pilots I felt had a tough time handling the aircraft, but they passed with flying colours! The ride at this point was smooth and seat belt sign was turned off. A few turns were made and we were soon on approach to Hong Kong International Airport! Touched down on runway 07L. Passing by this Boeing 737-800 of United! Is this flying to US? Nope, it doesn't have the range. Its doing short hops to other Asian cities, Ho Chi Minh City is one of them. There we are, the CX catering truck started work almost immediately to ensure the aircraft was ready for its quick turn over. For those nervous flyers flying to Taipei, I hope they wouldn't be too worried when the aircraft approach and land in Taipei later that day. Here are some videos of the take-off and landing! China Airlines has a long way to go to catch up with EVA Air and this also includes the arrival of its newest flagship, the Boeing 777-300ER. I am disappointed with the airline mainly for its poor in-flight service and website. The airline can certainly make some changes especially on the latter, being 2nd choice for locals or foreigners flying in or out of Taipei should be out of the window and instead aim to be the top airline and passengers' preference to fly with. Since this is my first ride with the airline, I need to fly a few more times to understand the culture in this company so I can't say I wouldn't recommend this airline to anyone but for sure, I didn't have a good impression and to fly with the airline again, I need to lower my expectation in order not to be disappointed again. As for the safety record, you don't have to worry about it, its safe to fly. In the same league as Cathay Pacific, Emirates, Singapore Airlines and a few others? Definitely no. Thank for reading my trip report, hope you have enjoyed it.